When it comes to race day gear, Mayhew is a man of excess. Our goal today is to break you of this pre-race stresser. And it turns out that the solution is easy. All it requires is a designated gear bag that contains everything you need to race. Shoes, helmet, embrocation, skinsuits. It all stays in the bag. Let me repeat that, because it is key. It all stays in the bag. Wash what you use and then put it back in the bag. It sounds so simple yet I cannot tell you how many times I have arrived at races to find a friend fretting in the parking lot because he forgot some critical piece of gear. The one difficult part of the process, other than training yourself to keep everything in the bag, is figuring out how to initially stock the race-day gear hauler. Instead of just giving you a checklist, we thought it would be a bit more interesting to dump out a well-stocked bag and see the gear laid out. 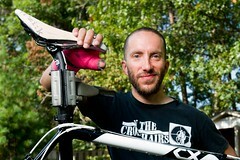 Here to help us do just that is JBV Coaching Associate Coach and CXHairs contributor, Chris Mayhew. On the road most weekends during ‘cross season, Chris is the perfect person to show you all the right bits to have readily available in your gear bag. I’ve seen the bag in person and I had no idea how much stuff was actually in it. People question me when I am leaving for races about my mass amount of stuff but I like the “can’t have too much” philosophy, just need to get it in one bag. Thanks for the tips Chris. Mayhew is the man when it comes to the process of racing cyclocross. From packing your race bag to previewing and learning a course he knows his stuff. Details matter. Sven, if you are who I think you are I make a point to follow you during warm up. Your lines are unparalleled. +1 on steali^H^H^H^H^H following Sven’s line. Works on MTB well too.